Outdoor Revolution’s “Cayman XLF” is a fantastic short-break motorhome awning, designed specifically to fit taller vehicles from 240cm to 290cm to the awning channel. Perfect for smaller families due to its integrated Two-Berth Inner Tent and sizeable living area; the UK’s best-loved pole-and-sleeve drive-away enjoys a cosmetic makeover for 2017! The fabric is exceptionally water-resistant and water will simply bead onto the surface and roll-off. Also, the light-coloured roof material reflects heat to maintain a comfortable temperature inside the awning. The product comes complete with a water-repellent Sewn-In Groundsheet for added protection against the elements. 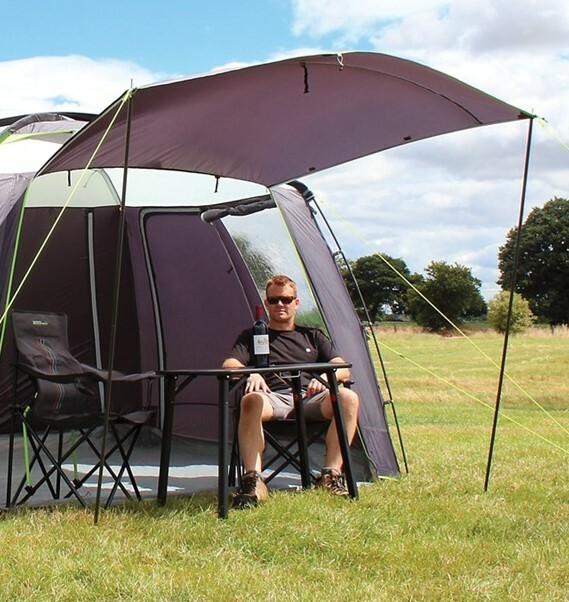 The integral annexe contains a Two-Berth Inner-Tent to provide additional storage/sleeping space; this is crafted from a breathable Micro-Polyester to create a more relaxing environment and help improve air-flow. The frame consists of three Fibreglass Poles in order to make assembly a speedy process. The PVC Window offers a clear, crisp view of the outdoors from the comfort and convenience of your awning; helping to bring the outdoors – indoors. All windows have integral Zip-In Curtains which can be rolled-back during the day or zipped-in for complete privacy during the night. There is also a Rear-Cowl Access Door to prevent disturbing sleeping guests and increase ease of access to and from the motorhome. The Ventilation Points help combat condensation by improving air-circulation within the drive-away. The drive-away comes complete with Storm Strap Attachment Points, Pegs and a Zip-Up Front Door (with Velcro at the Bottom of the Doors) to help retain its shape in the wind. A Stone Protection Footprint Groundsheet (for added protection against sharp rocks and hard ground) and Canopy Poles (to create a functional, sheltered porch area using the front door) can also be purchased for this product. 1. Cayman Tail which attaches onto the back of a vehicle as opposed to the side. 2. Cayman which is the standard version of the product, fitting vehicles from 180-240cm. 3. Cayman XL which is designed for taller vehicles, fitting vehicles from 240-290cm. 68HD Hex. Endurance Fabric - An Ultra-Lightweight Fabric with a Contemporary Print. Fibreglass Poles x 3 - Tough & Easy to Assemble Pole-and-Sleeve Frame. Velcro at the Bottom of the Doors - To Retain it's Posture in the Wind.